Dark Thoughts has posted a series of new Season 3 promotional photos. There are photos of cast members together, and individual shots. Dynamite Entertainment launches the all-new, Battlestar Galactica comic book series based on the "re-imagined" Battlestar Galactica. "That episode actually turned out so epic that they recently split it into two shows. The second half of that split contains one of the most exhilarating action sequences I've seen... like, ever. I jumped out of my chair during the spotting session! You're all in for a treat in October..."
The BSG science consultant Dr. Kevin Graizer writes about the technical details in the show at HNR's Flight Deck Tech Blog #6. And, lastly, but most interestingly, Keith McDuffy at TV Squad reports on his initial vieweing of reviewer DVD's Sci-Fi Channel sent out of the first four episodes of season 3. (Minor spoilers, for the most part, but mainly just gives his first impressions.) He concludes, "So yes, be excited for season three. Very excited." Ronald D. Moore has updated his Battlestar Blog with his views on surviving disasters. It was a year ago, as I watched the Katrina coverage, that I first thought about doing this blog entry. Now that we're on the first anniversary of that catastrophe, it seems like as good a time as any to at least talk about this subject. The subject is the one most likely to inspire yawns and rolling of eyes, so ready your mouse to click onto something else: Disaster Preparedness. And Sci-Fi Wire reports on the Battlestar Galactica writers at Worldcon over the weekend in Anaheim. 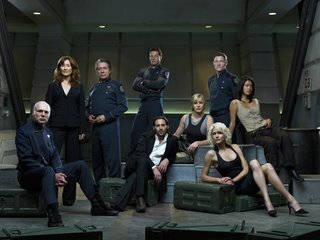 Ronald D. Moore, executive producer of SCI FI Channel's original series Battlestar Galactica, told fans that the upcoming third season of the hit SF series could see some fatalities among the characters. "Oh, there're some changes in the air," Moore said at the 64th World Science Fiction Convention, or WorldCon, in Anaheim, Calif., over the weekend. "We're going to lose some people this year. Not all of our friends are going to make it all the way." Moore declined to be specific, but said that the show's writers have finished breaking the story arc for the end of the upcoming third season. Moore added that the upcoming season 2.5 DVD set will include a special 90-minute version of the episode "Pegasus," which ran only 60 minutes in the original broadcast. In addition, fresh material in the form of specially filmed "webisodes," Battlestar Galactica: The Resistance, will air on SCIFI.COM's SCI FI Pulse broadband network twice weekly, starting Sept. 5. 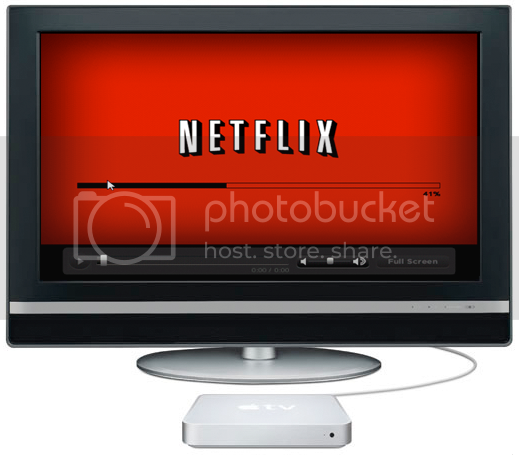 The two- or three-minute shorts will serve as a lead-in to the new season and, although not essential to the plot, will enhance the viewing experience. Moore was joined at WorldCon by executive producer Mark Verheiden, supervising producer Michael Taylor, story editor Anne Cofell Saunders, producers David Weddle and Bradley Thompson and SCIFI.COM senior vice president Craig Engler in screening a trailer for and talking about the upcoming season. When asked whether the show was still true to his initial vision, Moore said he felt it was on track, but that there had been surprises along the way, from both writers and actors, that made both the storyline and the characters richer. "One of the great things about writing for Ron is you do feel empowered to try things, and it doesn't have to be ... what was in the story outline," Weddle said. "I'm sure many of you remember in season two, where Callie shoots Boomer. That was never in an outline. That wasn't a planned moment. ... [Writer] Toni Graphia called Brad [Thompson] and [me] one day and said, 'You know, I think I want Callie to shoot Boomer.'" Lets say you really liked the Nickelback song "Savin' Me" from their album "All the Right Reasons" used in the first one minute long Season 3 BSG promo, then you will really enjoy this excellent video on YouTube by hirogen101. In the news, Ron Moore spoke about the BSG Webisodes. And the BSG "Story So Far" program is now available on X-Box Live. From kenradio on YouTube watch director Michael Rymer, give a tour of the editing faciity for Battlestar Galactica at Universal Studios in Los Angeles. The tone of the episode will be quite different from his previous effort, last season’s “Tigh Me Up, Tigh Me Down.” “This one will be more connected to the main body,” he says. “The other one was a comedy. We decided to try one in the first season just to lighten things up. And it worked well. I thought it worked very, very well. Are the Battlestar Galactica webisodes in danger because of a dispute between the WGA (Writers Guild of America) and NBC? According to the show's publicist, Sci Fi will be airing marathons of season two before the season three premiere. The first marathon is scheduled to air Sept. 28 from 8 a.m. to 4 p.m., the second one will air the day of the premiere, Oct. 6, also from 8 a.m. to 4 p.m.. These eight-episode marathons won't include every episode of season 2, but will cover most of them and will include every episode from the second half of the season (i.e. Season 2.5). And the Cylons make the list of best villains in SF television. Video of Battlestar Galactica fan, Scott Ian of Anthrax inside Starbuck's Viper on the Galactica, on the day of Anthrax's recent visit to the set of Battlestar Galactica. The Battlestar Galactica Video Blog has been updated with Jamie Bamber showing how he transforms into "Fat Lee Adama". 'Battlestar Galactica: The Story So Far' is a 44 minute program that will serve as a primer on the series, that NBC will air across various NBC networks and the internet. Click for details. 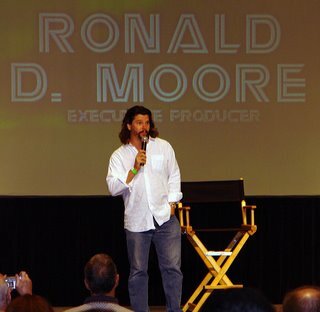 And Sci Fi Pulse has a new interview with Ronald D. Moore. Apparently, this is the demo trailer done by the now defunct Foundation Imaging (the company that did the CGI effects for Babylon 5 seasons 1-3, and worked on Star Trek: Voyager and other projects) for the abandoned Bryan Singer/Tom DeSanto Battlestar Galactica continuation project. Posted to YouTube by Bishop37. TV Shows on DVD has screen shots of the DVD menu screens for BSG season 2.5 due September 19th. Galactica Station has a trascription of Jamie Bamber interviewed in The Official Battlestar Galactica Magazine. Come to Burbank, California August 26-27th for Creation's Battlestar Galactica Convention. 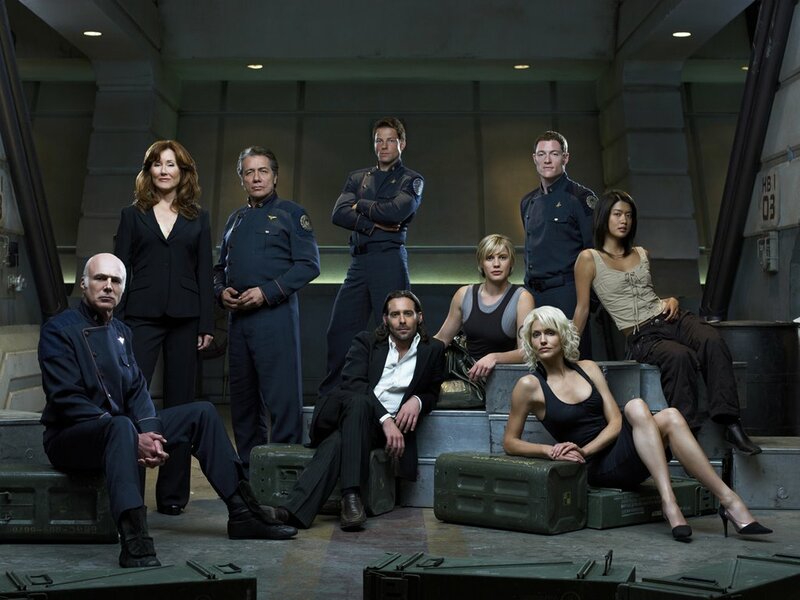 Guests include: Tricia Helfer, Jamie Bamber, James Callis, Aaron Douglas, Tahmoh Penikett, and others.